What more would you expect from the Highlands of Scotland, than Whisky Galore! Come and discover some of Scotland’s famous Whisky Distilleries, only a short drive from the Best Western Inverness Palace Hotel & Spa. The Highland’s is one of Scotland’s important Whisky distilling regions, there are many distilleries only a short journey from the Inverness Palace Hotel & Spa, which makes it a great base for your whisky tour. Glen Ord Distillery– on the edge of the Black Isle in the Highlands west of Inverness, is a delight to both the eye and the palate founded in 1838, with tours, Exhibition and Shop. You can distillers at work creating a magical malt whisky which is sweet, malty and dry on the palate. It is in easy driving distance from Inverness. A good selection of guided tours and special tasting tours are available. Opening times vary throughout the year. Glenmorangie Distillery, near Tain established in 1843 has been producing its famous malt on the tranquil Dornoch Shores. You will find a fantastic selection of Whisky Tours with unparalleled access to the Distillery & its Warehouses. You can experience all stages of the Whisky making process, learn about the pioneering use of only the finest casks and of course enjoy a Tasting too! 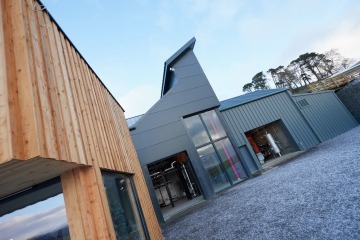 Glen Wyvis Distillery, Dingwall is the newest addition to the Scottish distilling scene. Nestled beneath Ben Wyvis mountain in the Scottish Highlands, Glen Wyvis Distillery was established in 2015. Dingwall’s last whisky distillery closed in 1926. After a 90 year absence, Glen Wyvis revived the town’s lost distilling tradition, more than 3,000 like-minded people invested in Glen Wyvis to create the first ever 100% community-owned distillery. Glen Wyvis is a pioneer of sustainable distilling; wind, hydro, solar and biomass energy power the operation. The distillery hopes to be welcoming visitors through its doors in Easter 2019 with the completion of their visitor center. Make sure that you check out their website and facebook page to keep an eye on the opening date. If you are passionate about Whisky and want to find out more about the whisky trails across Speyside, Elgin and Huntly then the best starting point is www.maltwhiskytrail.com the trail includes these distilleries all within driving distance of Inverness. Benromach Distillery is the smallest working distillery in Speyside. Founded in 1898, it was rescued in 1993, the HRH Prince of Wales officially opened it in its Centenary year. Now you can see the mash tun, the burnished copper stills and the brass spirit safe where the distiller’s craft creates the unique qualities of the single malt. During your visit discover the time-honoured skills of whiskey making, one that remains true to it’s heritage. “Nose” and enjoy a dram of the award-winning Benromach Single Malt in the old Drier House and now Malt Whisky Centre. Cardhu Distillery nestles in a picturesque setting in the heart of Speyside. Speyside is known all over the world as whisky country. The Cardhu distillery which is the only distillery started by a women, really does stand out from all the other distilleries in the Speyside area. The malt whisky produced at Cardhu has a warmth and cleanliness of taste which experts describe as “silky” and is used in some of the award winning Johnnie Walker blends. Open all year with a varied tour selection and shop. Dallas Dhu Distillery has a difference, it is a disused distillery owned by Historic Scotland but still offering the full tour of the whisky process through the ages and you can sample a wee dram. Tour highlights in include the Malt Barn, the Kiln, Mash House, Tun Room, Still House and into the Bonded Warehouses. You will gain enter the time capsule of Dallas Dhu and find out how Whisky was made. Glenfiddich – The Grant family built The Glenfiddich Distillery with their own hands and determination and is one of the few only family owned distilleries today. The crystal clear water of the Robbie Dhu Springs, the barley, the pure Highland air and the unusually small size of the stills, produced a single malt Scotch whisky which has stood the test of time and Glenfiddich has grown to become the world’s favourite single malt Scotch whisky. With an excellent selection of tours this impressive Distillery is a must see. Glen Grant – in 1840 the maverick style of the Grant brothers who founded Glen Grant had a passion for clarity and the unconventional which gave way to the design of the distillery and its surroundings, to the whisky’s clean, contemporary flavour. New openings include the Distillery Victorian Gardens which have recently been restored to their original glory. Tours and Tastings are available at this unique Scottish Distillery. The Glenlivet – *Winner of the Best Visitor Attraction Award at the 2013 Scottish Thistle Awards* The Glenlivet can only be made in one particular spot, in a single glen, in the heart of Scotland’s malt whisky-making country. Explore the turbulent history of the whisky smugglers, delve into the intriguing mysteries of distilling and sample the golden magic that is The Glenlivet. With an exhibition, gift shop and coffee shop it is a great day out for a Whisky lover! Glen Moray – a small friendly distillery means a warm welcome awaits you at Glen Moray Distillery in Elgin. Glen Moray has been distilled on the banks of the River Lossie since 1897 by a small dedicated team of craftsmen. In over a century of distilling at Glen Moray, much has changed. However, the ingredients, processes and the skills of those responsible for producing this finest quality single malt whisky remain constant. 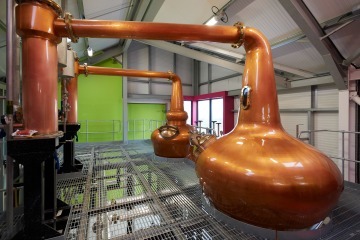 This is not your usual speyside distillery but one that offers a relax look at the Whisky with Tours and Coffee Shop. Speyside Cooperage – in the heart of Scotland’s rolling hills lies Speyside Cooperage, the only working cooperage in the UK where you can experience the ancient art of coopering. Since 1947, the family owned Speyside Cooperage has produced the finest casks from the best American Oak. Today the cooperage continues to work and produce the age-old product, still using traditional methods and tools. Although shipped across the world, many of the casks remain in Scotland, providing a vital ingredient in Scotland’s whisky making process. You will enjoy the journey through the lifecycle of the cask, see the highly skilled coopers at work, try it for yourself with the mini casks or simply relax and enjoy the gift and coffee shop. Plan your Highland Whisky tour and book your stay at the Best Western Inverness Palace Hotel & Spa. You can look forward to a warm highland welcome, we are ideally located on the banks of the River Ness, opposite Inverness castle. Only a few minutes walk to the Castle, the lovely Ness Islands and the vibrant capital of the highlands full of shops, cafes and bars to tempt you. Make the Palace your base, dine and sip your favourite tipple in the NEW Brasserie and Bar, there are plenty of whiskies for you to savor! Enjoy car parking, free Wi-Fi and don’t forget the lovely leisure club. See our seasonal specials for a selection of our very best offers. Remember always book direct for your very best offers Call: 01463 22 32 43 or Email palace@miltonhotels.com and one of our friendly team will be happy to help! The Inverness Palace Hotel is a perfect place to relax after a busy day exploring the highlands, take a dip in the swimming pool. book a massage in the Spa or relax those muscles in the sauna. All of our guests enjoy free access to our Luxury Leisure club. 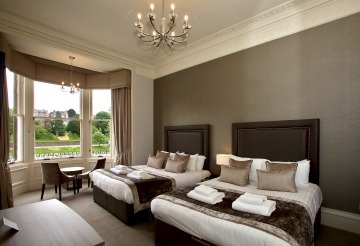 Add a little luxury to your getaway and book a Luxury Castle and River View Room. Wake up each morning to a fabulous view and enjoy the beautifully lit Inverness Castle and the Bridge as you draw your curtains in the evening.